by Dan Vogel, photo by Tom Penn Riverwest has its own ice rink. It’s located on Pierce Street, and was created by Jeremy Prach, currently the coach of the Dusters, a Pettit Ice Center adult league hockey team that includes many a Riverwester. This year Jeff ordered an ice rink kit – basically a giant 30’ x 50’ tarp with one foot high sidewalls. He installed it in his side yard and filled it with water, and it was soon frozen solid. He regularly resurfaces it with the garden hose, so the ice stays in great shape. 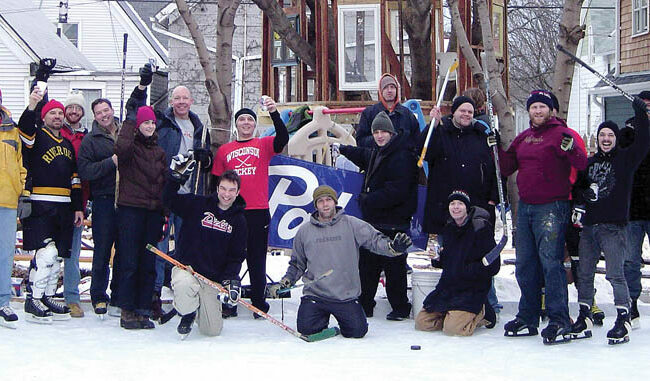 On New Years Day Jeremy hosted a 2-on-2 hockey tournament. About 15 hockey players participated, and probably another 20 people stopped by to watch and enjoy local beverages and a warm bonfire. Many expressed surprise at seeing an outdoor rink in Riverwest. While it’s fairly common up north in “hockey country,” it’s a big novelty down in the city. The following weekend I stopped by to skate a bit and found several local boys who Jeremy had invited up from the sidewalk to try their hand at skating. Once we got some old used skates laced up on them we helped them out onto the ice, gave them some hockey sticks and let them go at the pucks. They had a great time trying their luck shooting at the “goals,” two plastic milk crates. Jeremy’s son Loyal showed off his skating skills, all dressed in full hockey gear. Eventually a few adults showed up and we got down to business with another 2-on-2 game for a couple of hours. Even on such a cold day we worked up a sweat skating so hard. It was a nice group of people brought together from around the town by their love of skating. At the end of the long day, my wife Nancy came by to pick me up to go to the Riverwest Co-op spaghetti dinner fundraiser. It was a nice way to wind down the day, having a warm meal with fellow Riverwesters.